Here we are again, the night before Christmas and Darebin Council are making critical decisions about Preston Market. At the Darebin Council Meeting last night despite submissions from DADA, Save our Preston Market, The Darebin Progress Association, Darebin Ratepayers and Darebin Ethnic Communities Council, asking for councils support for the heritage application Council decided to back officers advice to not support a heritage listing to help protect our much loved market. On behalf of DADA members I ask you to support our application for a heritage listing and the highest possible protection for Preston Market. While the Executive Director’s recommendation is that our application is not likely to satisfy any of the criteria at the State level, it does with exactly the same emphasis, say ‘information presented in this report demonstrates that Preston Market may be of potential local significance’. The recommendation is that six of the eight criteria are likely to be satisfied at the local level. It is disingenuous lawyer talk to suggest that there is no reason to rethink past decisions rejecting a Heritage Overlay in the light of the new information in the assessment from Heritage Victoria. A heritage listing, a heritage overlay and helpful planning provisions would offer the highest level of protection possible for the Market and ensure that much loved and significant aspects of the market are preserved through the redevelopment process. These things are not mutually exclusive. There are other examples in Darebin and elsewhere where heritage overlays afford the highest zoning protection. Unfortunately our experience in Darebin has been, that the highest protection, the NRZ, was only granted to those areas that already had a heritage overlay. Remember how the height limit on Preston Market, set in the planning provisions, was treated. Councillors, do not make the same mistake twice by thinking that unqualified promises of ‘better’ protection in the planning provisions is the best possible outcome. At least one councilor has publically expressed dislike of the market building and suggested it is not worth saving. Assessment for heritage is not a personal judgment and the community would be much better served if councilors made objective assessments that reflected both the community they represent and the promises made in the last election campaign. We have seen the future project staging for the Preston Market site. Stage 3B replaces the current market buildings with a mixed use building on Mary Street to include a market, retail and 120 apartments. There are plans to build a total of at least 1540 apartments on the site with “retail space and supermarkets”. We are not convinced that the market we love would survive under the weight and critical mass of this type of development. The best way to save Preston Market is to save the building. It is not only important in its own right but because it encompasses all the other significant aspects and histories of the market. The best way to save the building is to support our application for a heritage listing, add a heritage overlay in the local planning scheme and develop comprehensive planning controls. Anything less looks at best half hearted and at worse a sellout. The In the past you have been supportive of the community taking action in the face of planning and lawyer advice and lack of support at a state level. We expect you to critically question recommendations on our behalf. Councilors you have the opportunity and a responsibility to make a decision that shows leadership and bravery. Work with us to save Preston Market by supporting our heritage listing application. As a representative of 2 community groups-DADA and Save Our Preston Market, I express my concern regarding the direction that the process is taking and encourage Councillor’s to keep an open mind, as we the public have often been reminded to do. In your deliberations, Councillors need to think very carefully in terms of ensuring the best interests of the public outweigh the financial gain of individuals. It is our view that through this elongated process, Council has not done the further research as recommended by Context and instead continues to dilute and play down the significance of the Preston Market. These attributes in our view, would be basic attributes that would apply to any open air market. These are not unique to Preston Market. So when Council continues to make claims in various forums regarding how much they “love” the market, is this the limited extent of there love for such an iconic place? If so, we the community are being sold short because the public see so much more than social significance. 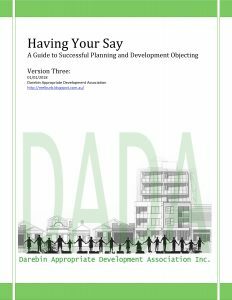 In the following two paragraphs of Councils submission, it states that ‘there are “ likely” to be better planning controls than a Heritage Overlay (in isolation) for the protection of the key attributes, such as the Incorporated Plan or a Design and Development Overlay’. But no DDO or Incorporated Plan has been cited to date and we wonder just how comprehensive this will be if they eventuate. So actually there are no guarantees as yet of any “protection”. It is our view that the community is being led further and further away from the real issue and that is to retain as much of the Preston Market on the existing footprint. This is what the 3000 or so members of the Save Our Preston Market Facebook Page have said in signing up. To save the Preston Market is to protect the building that encompasses all the internal attributes that Council has identified above. The community is not prepared to risk losing the Preston Market simply because Council seems to have such little regard or sensitivity for the significance of the site. To relocate the market to the less popular Cramer Street position could potentially be the kiss of death to the market. We need some definite reassurance of the future of the market and not just say so promises from Council. The Preston Market is an institution like no other in Melbourne’s north. It is in a fragile and precarious position and needs protecting through a Heritage Overlay in tandem with other tools and mechanisms. We ask Councillors to show courage and act as representatives of the community on this issue to reject or amend the Officers draft recommendations. Councilor Greco with support from Councilor Williams suggested a deferral of a decision in the light of new information received from the Ethnic Community Council Victoria, which he felt needed further investigation. Questioning of the officers showed that the recommendation was written without any consultation with any multicultural group and was predominately the view of the planning department. In debating the resolution to not support the DADA application for Heritage listing of Preston Market, Councilor Amir said two things that struck me as problematic. One, that as a scientist she makes evidence based decisions. I don’t think it is very scientific to make a decision on only one set of evidence and refusing to consider any other evidence bought forward that goes against this. It is very clear that council is not willing to support the community in challenging officers views. If this is the case then there is little need for Councillors. We may as well save the money and time wasting and go straight to the officers for a decision. In response to the plea for Councilors to keep their election promises to save Preston Market, Councilor Amir dismissively stated that she knows better now and so has changed her view. I don’t think the community can trust elected representatives who go back on their word for whatever reason and my hope that they will show this emphatically in how they vote at the next election. Councilors Newton and McCarthy supported these views.